• Autistic children are not able to recognize and interpret the emotions of other people. • The language capabilities are usually limited. • Usually these people experience difficulties on starting a conversation, or to continue a conversation. • Often they have a preoccupation with a single subject, activity or a certain gesture. In scientific literature several studies have been presented focussed on the possible relationship between autism and biometric hand features. The continuation of the present page presents a short description about how the knowledge about autism evolved during the 20-th century. And in the second part I present some research results which indicate that autism is frequently accompagnied by rare dermatoglypics on the little finger. an unappreciated piece in the AUTISM-puzzle? After about a half century of research the phenomenon 'autism' is still considered as an unsolved puzzle. After the disorder was discovered in 1943 by Dr. Leo Kanner, scientists have made many attempts on describing the symptoms. For the time being the results are described in the DSM-IV and ICD-10 (3). Within these classification systems autism is recognized as belonging to the so-called 'Pervasive Development Disorders' (PDD). For quite a while the causes of the autistic disorder were dramatically misunderstood. In the sixties and seventies most psychiatrists inclined to attribute the disorder to "... de kille houding van de ouders ..." [a cold attitude of the parents] (4). Meanwhile scientists have discovered that hereditary factors - e.g. the genes - play an important part in the development of the disorder. Though the autistic disorder is usually present in at least 16 out of 10.000 babies (= 0.16 %), brothers and sisters have a 3 to 8 percent chance for getting diagnosed with the same handicap (1). Another observation is that autism is frequently accompanied by a deviation in the brains: larger volumes are reported in several studies (5), and some aspects of the brainstem (1), the cerebellum and the limbic brains appear to be retarded in development (6). The large brainvolume is frequently accompanied by a large diameter of the skull (OFC) (7,8,9). Apart from a large diameter of the skull other physical features were reported to be related to autism, e.g. : small feet combined with normal hands (10), and ear abnormalities('posterior rotation' (10), low seating of the ears (1,11) ). Various researchers have also conducted research focussed on studying the relation between hand features and autism. Recently John T. Manning has established in his work 'Digit Ratio' that autism is frequently accompagnied by a so-called 'low 2D:4D ratio' - which indicates: a relative short index finger compared with the length of the ring finger (12). By the way, in only three studies (13,15,16) palmar dermatoglyphics were analyzed as well. On the basis of the research results which I have found in my own studies, I am inclined to say that in most of the published studies the attention of the researchers was one-sided focussed on the dermatoglyphics on the fingertips. On top that: the intelligence of the autists is usually hardly defined, and in most studies the autistic males and females were not studied seperately. 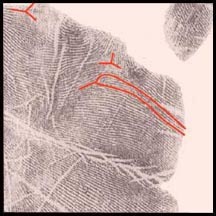 • FEATURE 2: 28 triradii are found in both hands + the proximal transversal line (the so-called 'head line') starts in both hands attached to the longitudinal line (the so-called 'life line'). For this combination was not found at all in the hands of the control group (= 0.0%) - which includes 200 normal males - the presence of this combination of hand features appears to be a strong indication for behavior problems related to autistic spectrum disorder. By the way, this is not an 'arbitrary' combination of hand features. For, just like the above mentioned 'low digit ratio' - according John T. Manning is this hand feature frequently observed in the hands of autistics - FEATURE 1 and FEATURE 2 are known to be observed much more frequently in the hands of apes compared to the hands of human beings. As well in the hands of autistics! Combined with the observations presented in the section Male-female differences, one can even use these observations for an explanation of the fact that autism is much more frequently observed in males compared to females! Firstly, a short description will be presented for the variants of each hand features which are observed in the hands of the (intelligent) male autistics. Secondly, the frequency of these variants will be described for both the autistics (N=19) and the control group (200 males). 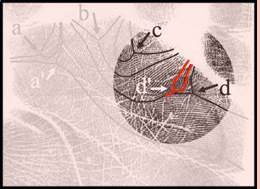 The figures in the table show that a double loop on the little finger is frequently observed in the hands of autistics. The figures above show that an extra triradius + an accessory loop in zone I4 is frequently observed in the hands of the autistics. These figures indicate that a fused triradius (C+D) in zone I4 is (including an AtD-angle smaller than 35 degrees), is frequently observed in the hands of autistics. 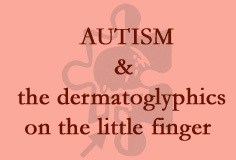 The figures above show that a loop or whorl positioned below the triradius of the little finger, is frequently observed in the hands of autistics. The studiend autistics show quite frequently two loops below the little finger. 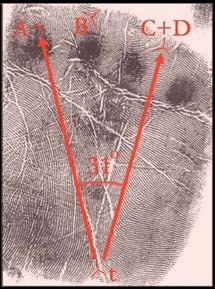 Examples of triradii which can be observed in both the palm and the fingertips. 7. OFC (= Occipito Frontal Circumference): the diameter of the newborn skull measured around the forehead and the lowest point of the back of the head.